Southern New England Ultraviolet Company was established in 1947, with its primary market in the use of ultraviolet energy for the sterilization of laboratories, hospitals, and food manufacturers. 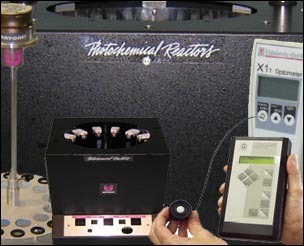 In the mid 50's, the development of Rayonet Photochemical Reactors© was introduced to the chemistry field. We are a privately owned and operated manufacturer of high quality Ultraviolet technology products. Over 40 years of design and process engineering experience has gone into each and every product that you see. We ensure that the Ultraviolet Lamps and Rayonet Photochemical Chamber Reactor© line will enhance your scientific capabilities. Please Note: Each Rayonet Reactor© is made-to-order, hand-built and tested by one person to ensure the quality and reliability of our products. Light sources are stock items and custom wavelengths are available.